When you install a license, Veeam Agent for Microsoft Windows automatically selects the product edition that is allowed by the license. If a license supports both the Workstation and Server editions, Veeam Agent for Microsoft Windows will select the product edition based on the type of the Microsoft Windows OS installed on the Veeam Agent computer. From the main menu, select About. In the Version section, click Manage license and edition. In the dialog window, in the Edition section, select the desired product edition. To learn more about editions of Veeam Agent for Microsoft Windows, see Product Editions. 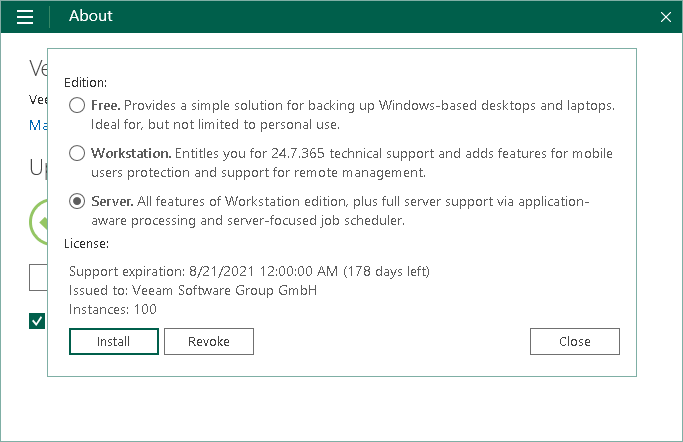 After you switch from the Server edition to the Workstation edition, or vice versa, Veeam Agent for Microsoft Windows will disable the backup job. This operation is required, because backup retention policies and available backup job options differ in Workstation and Server editions. To enable the job, you must edit the backup job settings in accordance with the selected edition.